As the International Cat Day (8th August) is just around the corner, this month I’m sharing my favourite picture book with fantastic feline character. 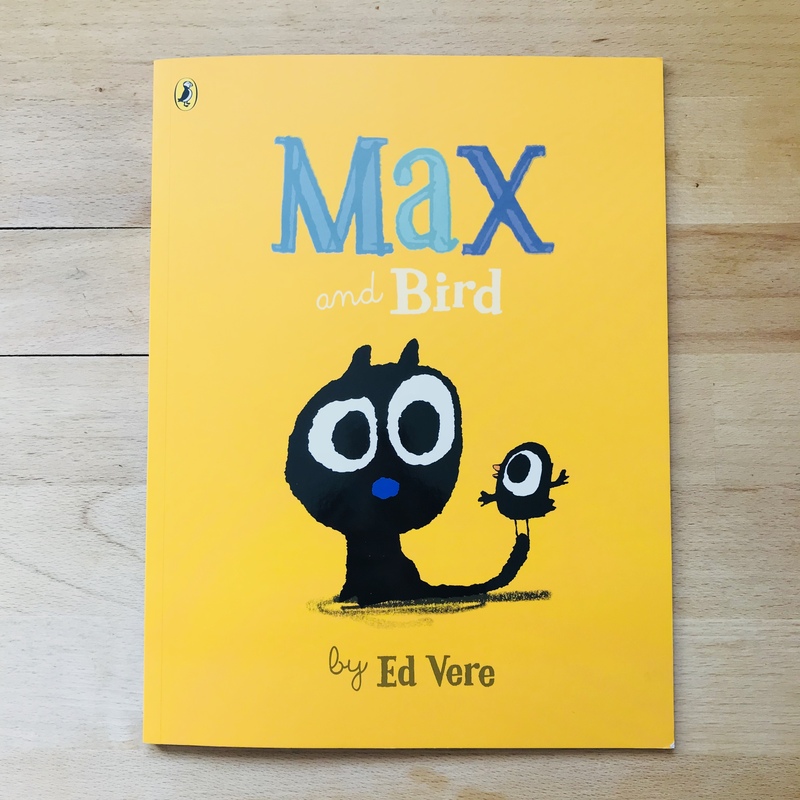 It’s Max and Bird by Ed Vere (Puffin Books 2016). Max and Bird is the third book in Max series. I fell in love with Max when I saw the huge-eyed black kitten in the superman cape with serious expression on its face on the cover of the first in the series, Max the Brave (Puffin Books 2015). I fell for him even more when I got to know him more through the story. Max is a fearless and brave kitten yet still young and naive. That’s what makes Max so lovable. The story is basically about “ignorance is bliss” and it’s very very funny. The second of the series, Max at Night (Puffin Books 2015), is equally funny and sweet. And then (“at 5:23 pm precisely”) Bird hovers in the air! But does this mean it’s time for Bird to be a tasty snack for Max?? Max weighs pros and cons of eating Bird for a quite long time. And he realises what friendship is all about and comes to his decision. What makes Ed Vere a great picture book maker is his ability to think like a kid and understand their logics and his eye-catching illustrations. For example, Max and Bird are basically just black blobs with huge eyes, but they are expressive and packed with charming personalities. I don’t know how he does it. I’m also a big fun of his signature use of simple and bold flat colours and minimalist approach. Max and Bird pop against each page’s bright, differently colored background. Delightful. When you compare Max the Brave and Max and Bird, you can see Max is getting a wee bit mature. It gives you a special feeling as if you are watching him growing up as the series goes. I do hope there will be more Max books coming out! Happy International Cat Day, everyone!